This morning it was very beautiful day, but the clouds came to Shirahama in the afternoon. I went to "Ogasaki Wing", the spot where we can see Izu seven islands and Shirahama. And I took this picture. This entry was posted in nature, Sea on 2006年10月25日 by izusakuraya. Today it was almost cloudy and we had sometimes a little rain in Shirahama. 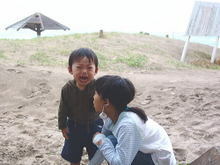 As I had to go to Shirahama Tourist Information I took my children, Hikari and Yuuki, together. 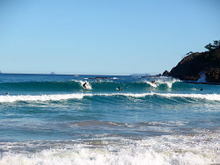 There was nobody on the beach, even surfers, becase we did not have good waves today. When I was in the office I heard a voice of Yuuki crying outside. "Yuuki wants to get off the shoes. But I said No because it is rainning here today." I sometimes take my children recently and my son plays on the beach, so he wanted to do it today too. ….. This entry was posted in beach, Family on 2006年10月22日 by izusakuraya. Today it was beautiful day, so I went to Nishi Izu with my son, Yuuki. After 1 hours driving we could see the ocean and drove for 5 minutes we got to "Sawada Koen (Open-Air Spa)"
When we arrived there was nobody in a parking lot and I found a sign at the reception of this Onsen. "Closed on every Tuesday" it said. But I was not going to take a bath there because my son had a little cold today. After parking my car we went up the steep steps to get to Onsen on the top of hill. "Hey Yuuki, watch your step !!" ….. 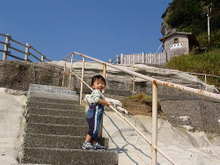 This entry was posted in Family, Travel on 2006年10月17日 by izusakuraya. Today we had no wind in Shirahama. The sun was shining and the sea was really beutiful. There was a group of surfing but they didn’t have good waves here. Today it was good day for reading a book on the quiet beach. 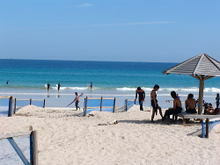 This entry was posted in beach on 2006年10月12日 by izusakuraya. Today it was very beautiful day too !! There was no cloud in the blue sky and we could see Izu Oshima island clearly. Actually I wanted to go to the beach to take a picture but didn’t do it because I had clean up the rooms today. Some of our guests went to the beach to swim and read a book at the balcony outside. "It was not cold and enough to swim !!" How do you get to Shimoda from Tokyo, by train or by car ? The best way would be taking Limited Express Train "Odoriko" by JR.
train goes to Simoda directly. Free Kippu" for this train. You can get the informations in detail in the following webpage. book the seats as soon as possible. We have 2 ways to get to Shirahama from Tokyo by car. photos in the following webpage and bring it to find our Pension easily. This entry was posted in nature, Pension Sakuraya on 2006年10月8日 by izusakuraya. A beautiful sky after typhoon, Shirahama Beach !! I had been worrying about Typhoon one week ago, because we have many guest during these holidays. But it didn’t land to Japan fortunately this time at last. 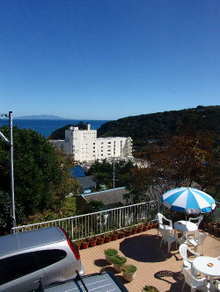 In stead of typhoon we had a very beautiful day in Shirahama. The blue sky and shinning sea, everything is excellent. 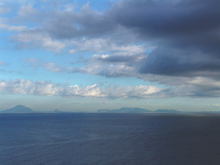 Besides we coudl see Izu Seven Islands clearly today !! After cleaning up I went to the beach to take a picture with my chidlren. ….. This entry was posted in beach, Family on 2006年10月7日 by izusakuraya. The busy summer was finished at the end of last month, so Sakuraya is very quiet recently. This autumn we decided to change Tatami Mats of Japanese style rooms. We got the new Tatami Mats of Room 101 today. The new Tatami Mats are really good smell, and we can be relaxed very much. And as we changed the wall paper last spring this room seems like new room ! By the way, when I was taking pictures of this room my son, Yuuki, came into. ……. This entry was posted in Family, Pension Sakuraya on 2006年10月4日 by izusakuraya.